510C Camshaft Kit, S&S, FREE SHIPPING! 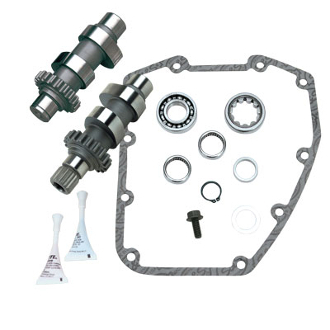 Our Products >> 510C Camshaft Kit, S&S, FREE SHIPPING! S&S 510C chain drive cam shafts for 1999 - 2006 use the stock Harley-Davidson® chain drive mechanism and offers an economical option for engines with mild performance upgrades. Kit includes cams, gearcover gasket, cam bearings, and instructions. Since 510C cams are used with the stock chain drive system, they are recommended for use with cylinder heads with stock valve springs or performance valve springs with no more than 160 lb. of seat force. For more demanding applications we recommend the S&S gear drive cams. Not available for 2006 Harley-Davidson® Dyna® models, 2006 Dyna® models require 2007 - up style cams.